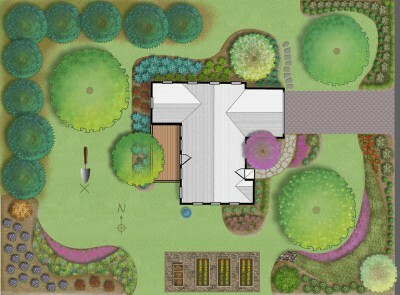 The key to having healthy plants and a beautiful landscape is planning. You can save both time and money by matching plants to the conditions in your yard. 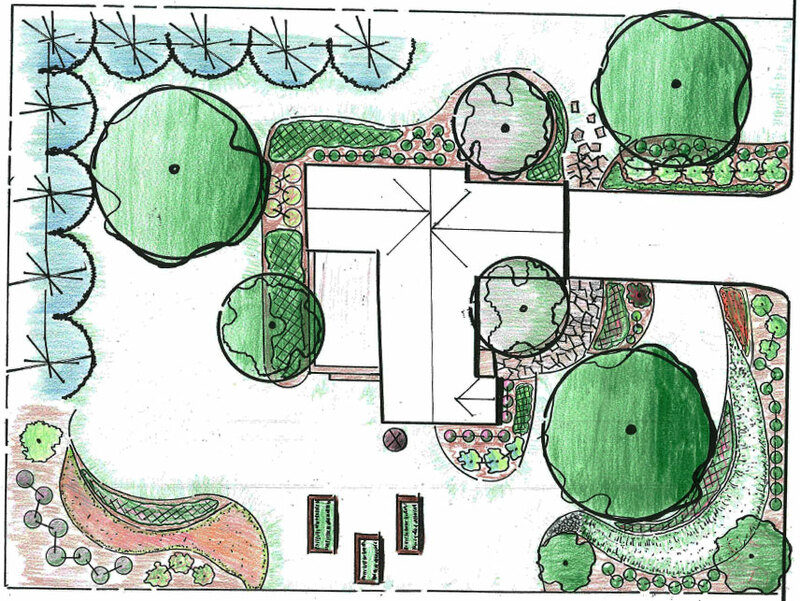 Before making any landscaping decisions, walk around your yard and draw a sketch of its natural and man-made features. Include buildings, driveways, sidewalks, decks, patios, existing vegetation (lawn, trees, foundation plantings, garden beds, etc. ), and water features. Add a North-South directional arrow and note how many hours of direct sun each planting area receives during the growing season. Indicate any slopes in your yard. Draw arrows to show the direction of water flow during a rain storm, and mark the location of any wet spots or drainage problems. Look for patterns in the movement of people, pets, and vehicles around your yard. Note the direction of winter winds and summer breezes. 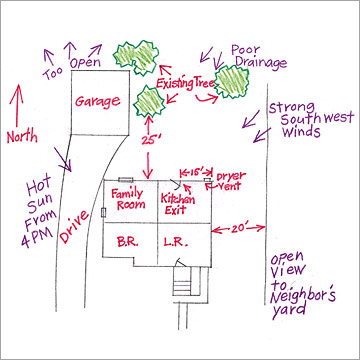 Record your observations and collect as much information as you can about the conditions in your yard. A soil test is a good start to understanding what kind of plants will grow best in your yard. Get to know the soil in your yard before you start planting. 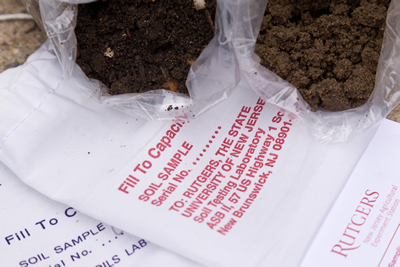 The Rutgers Soil Testing Laboratory provides a fee-based soil testing service. The lab can test your soil for pH, nutrient levels, soil type, organic matter content, and soluble salt levels. You can order the soil test kit online or purchase one from your local county office of Rutgers Cooperative Extension. Find out more about starting with healthy soil in your Jersey-Friendly Yard. Use your sketch and notes and the soil test results to guide you in your plant selections for a specific area. Is it sunny or shady? Is it dry or moist? What is the soil type and pH? Are there any special considerations, such as deer resistance or salt tolerance? Are you trying to attract wildlife? Do you want to create a wind break or provide shade to reduce summer air conditioning costs? Is there a view you want to preserve, or one you would like to block? If you have a purpose in mind for planting an area, that will influence your plant choices. When considering plants, make sure you know how tall and wide each plant will be when full-grown. It’s important to leave enough space for growth. Plants need adequate space for good air circulation and light exposure. Overcrowding stresses plants and increases susceptibility to diseases. Keep mature height and spread of trees in mind when planting near power lines or close to a house or property line. It’s up to you to decide the look of your yard. Whether choosing flower colors or an overall design style, personal taste plays a key part. Keep the following tips from landscape professionals in mind as you make aesthetic decisions about your yard. For continuous bloom and color from early spring through late fall, plant a variety of perennials that flower in different seasons. Foliage adds both color and texture to the yard. For seasonal interest, especially in winter, look for plants with interesting bark, fruit, or seed heads. The different shapes, or forms, of plants (such as clump-like, rounded, or spiky) can be mixed for visual effect. Arrange plants to maximize viewing them, usually with smaller ones in the front of beds and taller ones towards the rear. Plant groups of the same kind of plant for more visual impact. Use a large plant and/or one with especially interesting features as a single “specimen” to provide a focal point. When planning a new bed, use lime, twine, or a garden hose to mark the outline before planting. Long, flowing curves give beds a more natural, informal look; straight lines and geometric shapes are generally used in formal gardens. 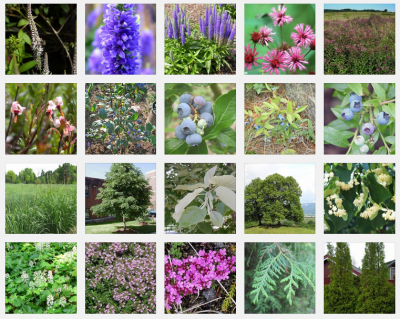 Search the Jersey-Friendly Yards Plant Database to create a list of plants matching the conditions at the planting site and your personal preferences. The Jersey-Friendly Yards Plant Details will provide more information about each plant to help you narrow down your final selections.